Please contact owner John 720-280-9739 or Email: omanfan@me.com . Includes Raymarine E-120 GPS/Radar/Depthfinder/Autopilot/Wind Instruments, plus a TV, DVD Player, AM/FM/CD Stereo, and VHF Radio. 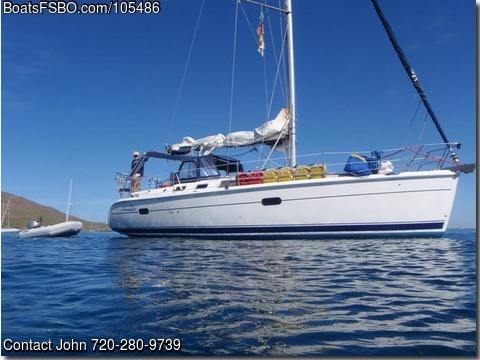 There is a Swim Platform, Teak Flooring, Full Galley, Stove, Microwave, Refrigerator, H&C Water, Dockside Power, Head, Shower, Lots Of Storage, and Sleeps 6. Three Sails include Fully Battened Main, and resown Jib done in 2018, Rollerfurling, Sail Covers and 4 Winches. Safety Equipment includes Bilge Pumps, Coast Guard safety Package, Anchor w/Windlass, West Marine Inflatable Dinghy w/Outboard, and an Inflatable Kayak. Fully Documented Vessel located in Nuevo Vallarta, Mexico in an Available Slip, and Maintained Immaculately.